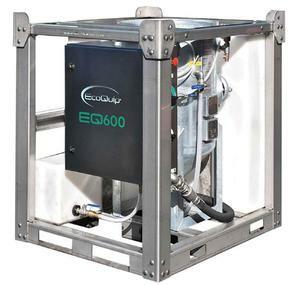 The EQ600S is our high-production, stand-alone unit that attaches to any 375~600 cfm air compressor. It has the ability to blast from 30~140 psi. This unit comes with a hot-dipped galvanized blast pot, stainless steel crash frame, control panel, plumbing and components, and our user-friendly controls. It has a 125-gallon, UV-protected poly tank. All of our units are designed to withstand the toughest conditions. The EQ600S comes standard with 50 feet of blast hose, pneumatic or electric dead man control, and a #8 nozzle. The unit fits in the bed of any standard pickup truck. The EQ 600S is AVAILABLE for rent, rent-to-own and/or purchase. Contact us at 1-888-257-7729 for more information. Hose Length 50’, 1-1/4”ID, 2-ply blast hose weighs 55 lbs. To purchase the EQ 600S, head over to www.CJSpray.com or call us at 1-888-CJSpray for pricing and custom packages and rental info.